This scene in the creek of Waiheke Island caught my eye with its sense of intimacy between boat lovers and the sea, a place that even a seal would dream to be. With that note of imagination and a simple natural tone palette, I captured the air, the light and the romance of the scene. The place that is so peaceful and made perfect with a lullaby from the sea, a quiet night. The place is waken up with the sound of the morning light touches the sea! 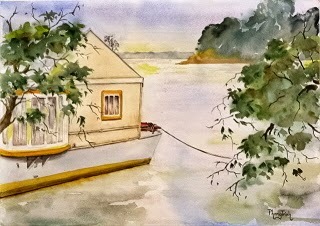 With this painting I felt like I have been had the privilege living in the boat house and watching the sunrise for 20 years!.. Imagine that!